We've gone freesia mad at Clare Florist this week, introducing not one, but two all new deluxe 40 stem freesia bouquets! Designed to accompany the Splendour Yellow Freesia Bouquet, we are proud to announce the arrival of Red Meadows and White Whispers. Undeniably eloquent, these bountiful bouquets are certain to immediately capture attention in any situation. Not only are freesia flowers inherently beautiful, they are also known for their distinctive, alluring aroma which means that these bouquets are a true feast for the senses. 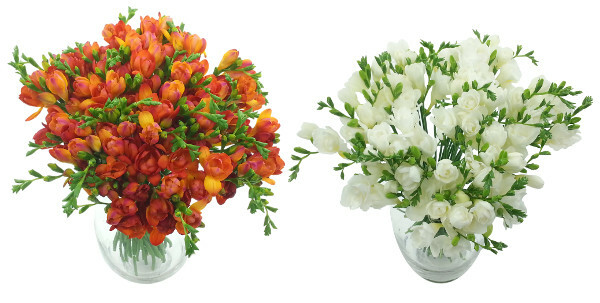 Both of these beauties are priced inclusive of free standard next day delivery so if you're stuck at the last minute for an unforgettable gift to surprise that special someone with, one of these premium 40 stem freesia bouquets ought to do the trick!